Will Ferrell accepts the 2011 Mark Twain Prize for American Humor. Paul Rudd Talks About Cracking Up on "Anchorman"
Will Ferrell: The Kennedy Center Mark Twain Prize aired on PBS stations nationwide on October 31, 2011. A lineup of top entertainers, including Ed Asner, Jack Black, Matthew Broderick, Adam McKay, Conan O'Brien, John C. Reilly, Paul Rudd, Molly Shannon and more, saluted Will Ferrell at the 14th Annual Kennedy Center Mark Twain Prize for American Humor on October 23, 2011. Raised in Irvine, California, Ferrell attended USC and graduated with a degree in sports information. Upon graduation, he worked as a sportscaster on a weekly show broadcast over a local cable channel. Soon after, he enrolled in acting classes and stand-up comedy workshops at a nearby community college and was eventually asked to join the esteemed comedy/improv group The Groundlings after just one year of training. It was at The Groundlings that Ferrell was discovered for Saturday Night Live. Will Ferrell Ferrell starred for seven seasons on Saturday Night Live. Some of his most memorable SNL characters include Craig the Spartan Cheerleader, musical middle school teacher Marty Culp, and President George W. Bush. Among his many impressions are Janet Reno, Alex Trebek, Neil Diamond and the late, great Chicago Cubs sportscaster Harry Caray. His work on SNL earned two Emmy nominations in 2001 (Outstanding Individual Performance in a Variety or Music Program, and Outstanding Writing for a Variety, Music or Comedy Program). Ferrell's film credits include The Other Guys, Megamind, Stranger Than Fiction (Golden Globe nomination), Talladega Nights: The Ballad of Ricky Bobby, Anchorman: The Legend of Ron Burgundy, Zoolander, Elf, the Woody Allen feature Melinda and Melinda, Old School, and the screen adaptation of The Producers, which earned Ferrell his first Golden Globe nomination in 2006 for Best Supporting Actor. Ferrell's latest project is set to star in the independent feature Everything Must Go, directed by Dan Rush. 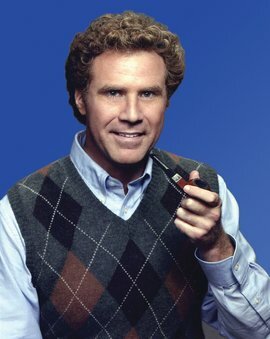 Based on a Raymond Carver short story, Ferrell portrays an alcoholic who has relapsed and in turn loses his wife and job. 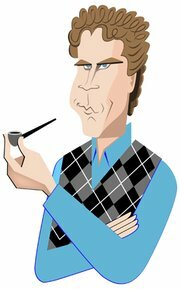 In 2009, Ferrell debuted on Broadway by headlining the sold out, one-man comedy show You're Welcome America. A Final Night with George W Bush. Nominated for a Tony Award® in the "Best Special Event" category and directed by longtime collaborator, Adam McKay, Ferrell perfected his infamous Saturday Night Live character "President George W. Bush." At the end of its Broadway run, Ferrell performed the show in its entirety live on HBO. In 2007, Ferrell and McKay founded the overwhelmingly popular and award-winning video website Funnyordie.com. With hundreds of exclusive celebrity videos and a steady stream of huge viral hits, Funny Or Die has become the "place to be seen" for comedic celebrities, and the obvious destination for a daily comedy fix. The site's first video, "The Landlord," has received over 73 million views and features Ferrell confronted by a swearing, beer-drinking two-year-old landlord. The site averages over 7 million unique viewers and over 24 million video views per month.